Birmingham's dilapidated New Street Station is to get a £598m revamp after the government announced it would provide the bulk of the funding. Transport Secretary Ruth Kelly announced almost £400m of government money will be poured into the project. The redevelopment will aim to ease congestion for 17 million passengers who use the station each year. 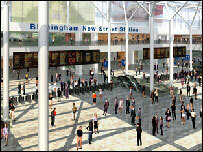 Network Rail and Birmingham City Council plan to start work on the project in 2009. Building work on the first phase should finish by 2011 with the station being kept open while work on the new concourse is carried out. The second phase is due to be completed by 2013. Built in the 1960s, New Street station has been criticised for its outdated look, lack of natural light and passenger congestion. Regeneration company Advantage West Midlands said it was important to the region's economy that the new station "creates the right first impression" to visitors. Following the revamp, the new station will have a 10,500 sq ms concourse and be a "bright, modern 21st Century transport hub for Birmingham and the West Midlands region", Network Rail said. The area around the station will also be regenerated and pedestrian connections across the city centre will be improved. Passenger capacity at the station will also be doubled while each platform will be accessible via escalators. Ms Kelly said: "Birmingham is a key gateway to towns and cities across Britain and this investment will make New Street a more enjoyable experience for its passengers. "This scheme has been in development for some time and has improved immeasurably so that it can now meet the needs of passengers and deliver a much-needed boost to capacity. "The government is making a major investment in Birmingham New Street and it is now up to Birmingham City Council and its partners to transform this station into one of the best in our country." The announcement follows prolonged arguments between the city council and the government over who should pay for the station redevelopment. Council Leader Mike Whitby said: "With the support of business, local politicians, and most importantly, the general public, the government has responded to our call for a better station for Birmingham. "This is not an overnight job. However, from 2011 passengers and the general public will enjoy the first benefits of this transformation." Iain Coucher, chief executive of Network Rail, said the company was "delighted", adding: "This is a much-needed scheme and is among a raft of projects that Network Rail is looking to take forward to expand and develop Britain's rail network in the years ahead." Business leaders in the city said the New Street revamp would provide Birmingham with " a great opportunity". Birmingham Chamber of Commerce chief executive Jerry Blackett said: "Today's announcement marks the end of the beginning for a long-awaited project. "New Street is a major strategic rail junction for the whole of the country and we expect the scheme will create a national showpiece in the heart of the city."